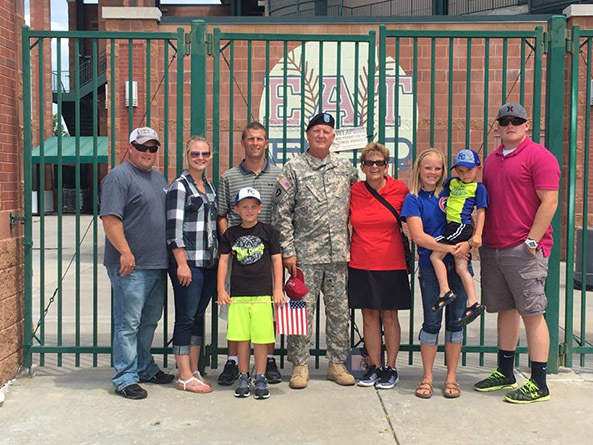 Above: Members of Sen. Tim Gragert’s family gather before his summer 2016 deployment. They include his son-in-law and daughter, Ross and Megan Becklun, son, Brent Eggerling, grandson, Braxton Eggerling, Gragert and his wife, Donna, daughter, Jessica Gragert, grandson, Mason Eggerling and family friend, Cade Kalkowski. When most people think of retirement, they might envision leisurely games of golf, time with family or days spent on a warm beach. Sen Tim. Gragert, on the other hand, decided to spend his retirement in the George Norris Legislative Chamber. A quick look at his resume shows a man who is happiest when he is busy. Gragert, one of 13 children, spent most of his life in his hometown of Creighton. Just two weeks after graduating high school in 1977, he enlisted in the military. Ten years later he married his wife, Donna. The couple have three children: Brent, Megan and Jessica. Their family has expanded over the years to include Brent’s wife, Andrea, and their three children—Braxton, Mason and Ashlyn—and Megan’s husband, Ross. Pictures of his bloodhound, Maggie, also take up significant space on his camera roll. Gragert retired in 2017 after 31 years working for the Natural Resources Conservation Service. Much of his time with the NRCS coincided with his 40 years of military service—23 of which were spent as a medevac helicopter pilot. He was deployed overseas four times, with his last tour in Iraq in 2016. “I’ve been to every continent in the world with the flying I’ve done, so I’ve been very fortunate to have my military career,” Gragert said. Between deployments and working for the NRCS, Gragert also found time to serve 12 years on the Creighton school board, 25 years as a member of the Creighton Volunteer Fire Department and to volunteer regularly on the St. Ludger’s Church cemetery board. Gragert feels he is doing just that by serving the people of District 40. The demands on a senator’s time during session can be overwhelming, he admits, but the real challenge for the retired military man is learning to just let go a little. As it turns out, the planes don’t always take off on time when you’re a senator. “I’ve really enjoyed Sen. Brewer’s mentorship and advice. Well, maybe not enjoy. I appreciate it,” he joked.